The appointment of Jose Mourinho has brought us mixed results for the 16/17 season. 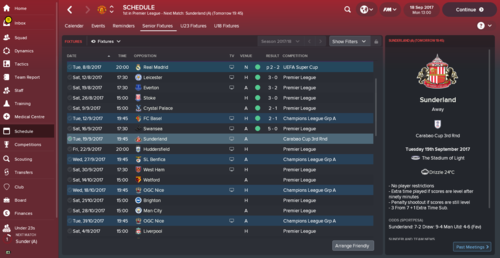 Though we won the Europa League, Community Shield and the League Cup, achieving 6th in the league was poor. Our squad depth is quite good, with the likes of De Gea to Bailly to Pogba to Lukaku. However, we still have room to improve the squad and bring up talented youngsters like Gomes and Gribbin. 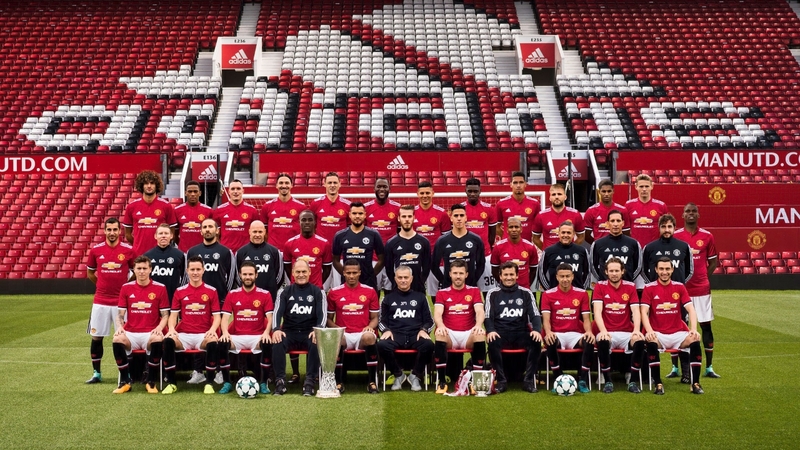 With the financial backing of a mega-money league TV deal and the pocketbook of well-known owners, the Glazer Family, Man Utd is ready for you to take control and continue to guide the club to return to its glory days. We have a world-class goalkeeper in the form of David De Gea. We also have Sergio Romero who is a decent backup. 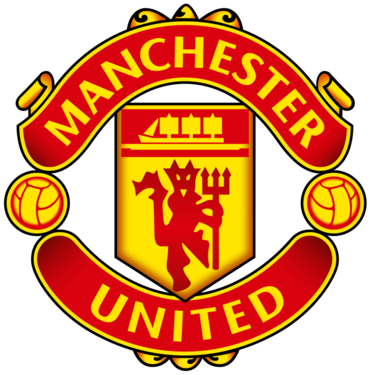 In terms of youth, you should look to develop talents like Theo Richardson, IIias Moutha Sebtaoui & Joel Pereira. If Sergio Romero is out with an injury, I would suggest snapping up Ventura on a free. Hopefully, you'll be able to keep Luke Shaw fit, as he has a lot of potential. At the start of the game, he is out injured so you can use Daley Blind who can do a decent job. Others like Marcos Rojo and Matteo Darmian could do the job as well. Going back to youth, I would say that Cameron Borthwick-Jackson would be an ideal choice when he comes back from Leeds on loan. If you're still unconvinced by these options, look out for Aaron Martin, a 21 yr old LB, from Espanyol. If things go well, Eric Bailly & Victor Lindelof may very well be the next Ferdinand & Vidic. You'll also have the decent backup in the form of Chris Smalling & Phil Jones. According to the coaching staff, Axel Tuanzebe and Ro-Shaun also have good potential, so maybe instead of looking around for replacements in your first team, these two lads are the way forward? It's also worth noting that Ro-Shaun Willims is a local lad, so all the more reason to develop him. This is definitely a position of strength within our youth system. For me this is a position that needs attention, not desperately, but still needs attention. We have Matteo Darmian and Antonia Valencia. I do prefer to use Valencia further forward, so for me we only really have one recognised right back in Darmian and he isn't in my opinion top class or even close to that. The more worrying thing for me personally is that we have no real cover in this area, especially if your like me and don't really want Valencia in this position if possible. Youth... Tyrell Warren & Lee O'Connor - Personally I don't think Tyrell Warren is good enough, but there's so real potential in 15 year old Lee O'Connor, so if you don't feel you have the funds to improve in the right back position, I'd definitely look at giving Lee O'Connor some game time and look to have him as a future right back. was awaiting for one of these. end Dec, top of league by 2 pts and only signed perisic. Additionally, to comply with HG rules, and because I rather like him, I got in Rafael after selling Darmian. Ashley Young is a must-keep atleast for a year, as he can slot in at both LB and RB, and do a rather good job at both places. CB, I'd honestly recommend getting someone (de Ligt?). Smalling is no longer the beast he was last season, inconsistent. The same with Jones, although he can still put in a shift. Bailly is beastly, and Rojo is good once he gets back. Tuanzebe can grow up to be pretty immense. In CM, pretty much stocked. In case you run out of funds for elsewhere, you can keep Fellaini, does a good job as B2B and BWM. In wingers, I got in Bernard and Pulisic, mainly because I rotate a lot. You can also get in youth prospects and Pulisic, and rotate him - he plays on both ends. 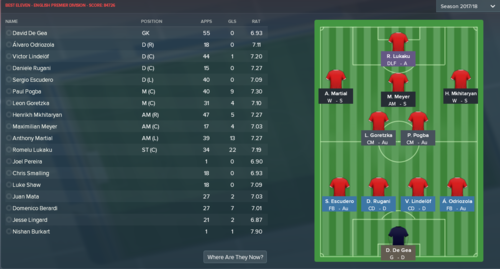 AMC, I got in Correa on loan, to rotate with Mata. You can also start giving chances to Gribbin and Gomes, both are pretty good. I sold Blind, Romero and Darmian to get in more funds to buy players. I sold Fellaini and zlatan got upset... didn't help team harmony either. Zlatan always gets upset. And refuses to tutor youngsters. Letting him leave on a free in the summer. Along with Carrick and Young. I started my Man United career when the Beta came out so I have already been able to complete my first season. It went really well as we comfortably won the league and also won the FA Cup. Note: I've omitted loans from the view so that all major transfers fit on one screenshot. This is the formation I played for most of the season, along with the games' perception of my 'Best Eleven' (which is fairly accurate). 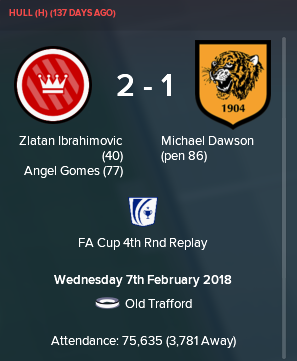 I haven't started my long term Man Utd save yet, as I'm currently carrying on my beta save with Wolves, but I intend to start it in the next week or 2 once I'm done with my Wolves game. 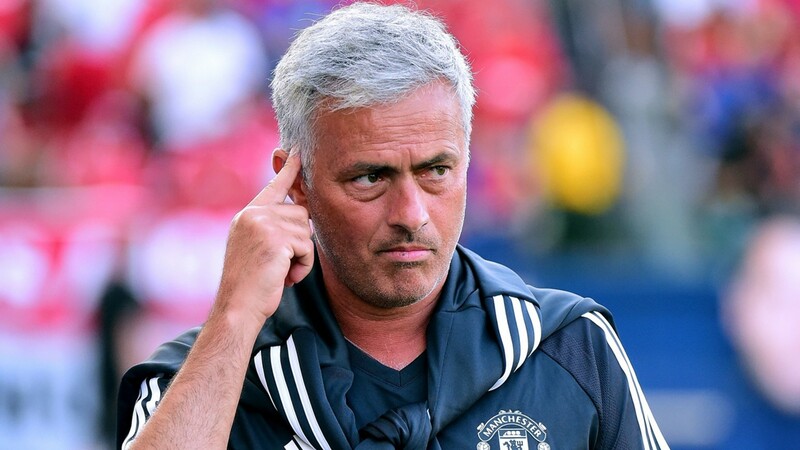 Anyway I was thinking about Tierney at left back to replace Shaw, how is he getting on in your save? quite good, used shaw for one match so far, both are similar types. Just started my long term save this weekend after playing a bit on the beta. Sold Darmian but couldn't get any takers for Young as I'd hoped for. Brought in Jose Gaya and Mario (from Villarreal), for 17M euros apiece, as new full backs to rotate with Valencia and Shaw. They're doing quite alright at the moment. Fellaini is already complaining that he isn't playing enough, and it's just somewhere in September! Lets have a look at your tactic then? 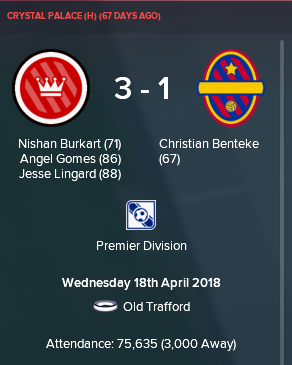 How did you play Lukaku? I focused more on changing staff roles & promoting rather than firing a load of them. I made Gerardo Guzman my DOF, John Peacock U23's Assistant Manager, Marcel Bout & Armand Benneker coaches, and Roy Beukenkamp a GK coach. Then I promoted Tony Whelan and Mark Hulse to the first team, and Tommy Martin to the U23s. I completely forgot about Paul McGuinness though, I'm going to bring him in now, even if I have to get rid of someone to do it. 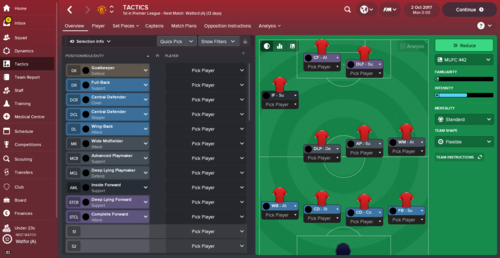 What formation is everyone using? I'm old school so I tend to play around with the thought of 4-4-2 at some stage in the game. But feeling we have more than an adequant squad to play 4-2-3-1 with more than enough to have players rotating in and out from the reserves too as I'll be looking to bring in some of the better younger players to the first team. I also played Lukaku as an AF in this formation. I know that paper he is probably as best as a TM, but I wanted to ensure there was room for my AM and IF, so selected the AF role. The frustrating thing was he picked up 5 injuries, total ling over 3 months out. He still had a good season though, scoring 22 goals and getting 5 assists in 32 games in all competitions. I stuck with 4-2-3-1 pretty much all season, although I do have a 4-4-2 trained as an option. Yeah I'm also going to try and bring through some of the most promising youth. For example, I gave opportunities to Gomes and Bukhart and they certainly took them! Playing a 4-3-3 with a flat 3 midfield, an AMR and AML and ST. 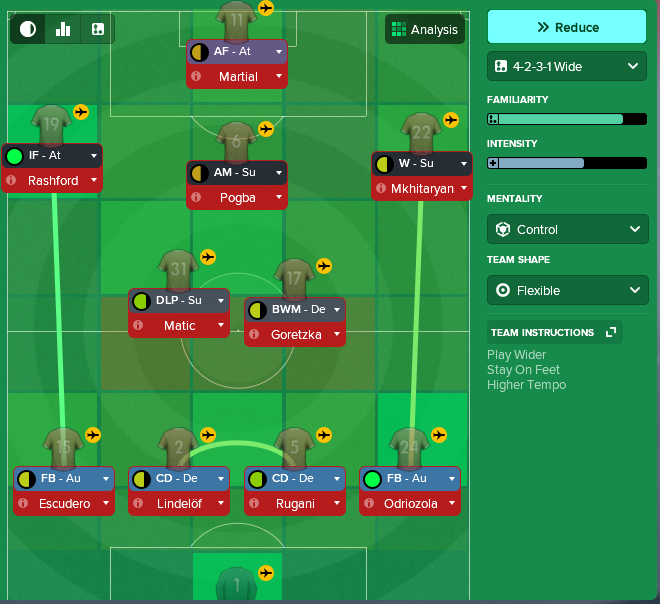 The midfield combination is CAR/S - DLP/D - AP/A (with forward runs) so I have enough runners from midfield. Gives a bit more defensive stability. Ah that’s frustrating! Silver lining is that Martial and Rashford will benefit from the additional game time. Noticed a couple of people have been able to pick up goretzka in first summer. 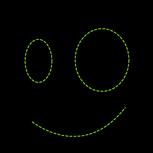 Is that just by unsettling him? His contact expires in June 2018 so you can buy him on a free in January. He’ll ask for a lot of wages, though. my AMC is Angel Correa, who got injured :(, Mikhi on the right wing. has anyone tried to copy the Woodward blueprint and target some big names like griezmann or bale? Anyone played Ibrahimovic regularly instead of Lukaku? I play with 4-3-3 (3 strikers, something I always did from FM 2010 or 11), I used him as AF and in the center, he is scoring so many goals. He came back from injury during Christmas fixtures and I'm April end and he has scored 25 goals. Scored twice against Barca away in semi finals second leg. His physical attributes are going down which is expected. When I started the save his acceleration and pace was 8, now it's down to 7 and going down. That didn't stop him scoring but I haven't offered him contract as next season it might go even lower. So not sure what to do. Also I have lukaku who is more suited to play in the centre of 3 strikers and bunch of regen strikers I have signed. So anyone had huge success with Ibrahimovic this season or you guys going with long term thinking and playing only Lukaku? Edit: also looks like this time offloading players isn't a big problem. In Beta I couldn't offload Young as he kept on rejecting any contracts, this time I offloaded him for 3 million to Brighton. Rojo - Some Chinese club made 18 Millon bid which can go up to 22-24 Million. Mkhitaryan - IIRC it's 30-40 Millon to Madrid. Alex Vidal - 7.5 million he is transfer listed, he has the highest rating out of all players. Has more than 10 assists in league alone. I would recommend him very highly as RBs are hard to find. Romero - around 2.5 to 3 million. 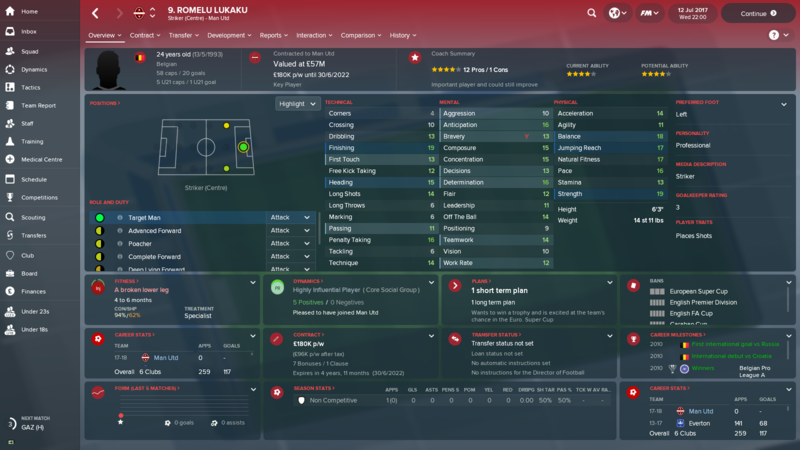 Previous edition's wonderkid. He has good allround stats and versatile. Decent back up. Zeca - 9 million. Had signed him last year for RBL. His weakness for big matches but this season as per scouting report he relishes big games. He can play as RB and LB. Dollberg - Around 20 Million. Fantastic prospect and a complete forward. Dembele - I think 10-15 Million. 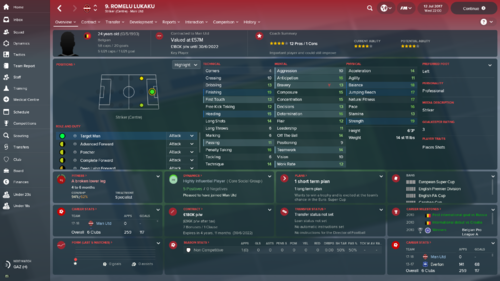 Signed him as I play with 3 strikers, so needed depth. Signed him last year wit RBL and he won CL scoring huge goals. Lost league when he was injured. His finishing stats was around 14 but he scores a lot. Same this year, scored whenever played but got injured for months. out of interest, which players did you use in each of those midfield roles? And what is everyone doing with Pogba? How to get the best out of him? In 2017 I played in as an AP (A) in the CM position where he did pretty well but is anyone having joy playing him in the AM position? Currently 10 games in and playing Pogba in a CMA role. Not blow-you-out-of-the-water brilliant but he's my best player. He's not the heartbeat of the side which is what I wanted. I'm having real problems with my left IF, it's Martial or Rashford and I'm not getting anything out of them at all. Anybody care to help? Made 50mil and IMO all my signings are cheaper and better than their predecessors. What'd you do with Matic? Rotate with him or pogba? I'm enjoying a fantastic start to the season. Lukaku, Rashford and Martial are ripping teams apart! If you are starting new save then Alex vidal will be transfer listed. He is superb RB. @DannyFM87 what tactics are you using? I'm really struggling. Yes just rotated Matic, Herrera, Pogba and Goretzka frequently. Matic started 28 games in all competitions. 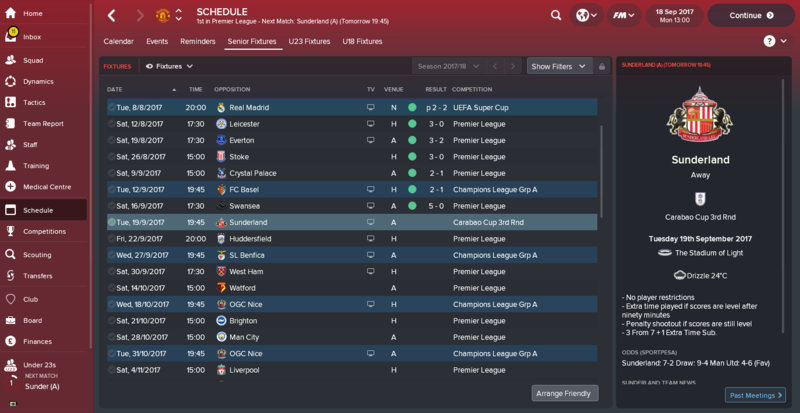 Just about to start my second season. 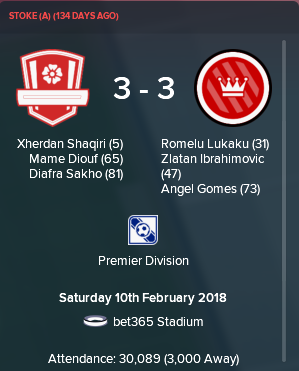 Won the Community Shield by beating Spurs on penalties after a 3-3 draw. Prioritised signing Alli and Dier and dedicated most of my budget on achieving this. Ibrahimovic and Carrick also retired in the summer, which isn't included on the outgoings list. That is my current line-up midway through my second season. Playing some beautiful stuff at the moment. First season I only managed a 2nd place finish and no trophies but looking better this time around. Got good balance in the team now which was lacking before. Most of my signings have been bargains in this day and age in all honesty, Goretzka (free), Sanchez (free), Theo Hernandez (£4.8m), Winks (£9.75m), Tierney (£18m) and even Asensio who I just brought actually only cost £28m. Not sure what Madrid are playing at there although he has just recovered from a broken leg. Griezmann (£89m) and van Dijk (£46.5m) are what I'd consider my big money deals. Having sold quite a few players too my net spend isn't that high which is pleasing. Couldn't post screenshots of your team instructions, could you? Thanks for the recommendation cost me £34M as he had this as release clause. Does anyone use the director of football or do you sack him?